Recently I was struggling with my skin more than usual (think bumpy texture, dullness and huge pores) and I decided it was time to re-evaluate my products and incorporate some new things into my routine. Tons of moisturisation is still my key to success, but sometimes you have to bring in the big guns! After a bit of research online and some gentle encouragement from r/AsianBeauty, I treated myself to 3 CosRX products that I’d been eyeing – AHA 7 Whitehead Power Liquid, BHA Blackhead Power Liquid and Advanced 96 Snail Mucin Essence! I’d never used any products from Korea before so I was really excited to give these a go. The BHA Blackhead Power Liquid was the product I was most excited for and what really drove me to make this order. I hadn’t yet found a salicylic acid product that was fatty alcohol free other than Stridex. I knew that the benefits of reducing sebaceous filaments and closed comedones were two things I really needed so I gave this a shot! It’s a very watery liquid with a slight smoky smell if you get really close. BHA should be used on clean, dry skin before moisturiser. There’s absolutely no stinging on application and it dries down quite quickly. I think that this has been the extra push I needed to clear up my stubborn closed comedones and provide some anti-inflammatory goodness! To follow up the BHA and make the most of my squeaky-clean pores, I also ordered the AHA 7 Whitehead Power Liquid. I already had the Mizon AHA which I reviewed in the past and liked a lot, but to be quite honest I needed to reach free shipping so I thought I’d give this a go. The Whitehead Power Liquid is an Alpha Hydroxy Acid and loosens skin cells, unlike the Blackhead Power Liquid which words to dive into the pore and dissolve sebum. This product is also a very watery liquid, barely any smell, and doesn’t sting on application. My skin feels super smooth after using it and overall seems a lot brighter and glowier! I use this a few minutes after my BHA, and leave it about 10 minutes before continuing with my routine. Of course, with all this chemical exfoliation, I was fully aware of the need not to go down the path to dehydration again. So I decided to also order the Advanced 96 Snail Mucin Essence. This product has a goopy serum texture thanks to the 96% snail filtrate in the ingredients! That’s right, CosRX collects the goo that snails leave behind and bottles it up for us brave/crazy enough to put it on our skin. It’s supposed to be incredibly soothing and speed the healing process, and so far I can attest to that! I’ve been able to use the AHA and BHA together daily and I’ve had no redness or flaking, which I think is thanks to this essence. This product goes on after AHA and BHA, but before any heavy moisturisers, oils or occlusives. First of all, I love CosRX’s cruelty free philosophy and cute branding. The packaging for these products specifically is really sleek, being a heavyweight frosted plastic that almost feels like glass but won’t smash if you drop it. The pumps are hygienic and convenient and the clear bottle means it’s easy to tell how much product you’ve got left. The minimalist ingredients lists are so awesome for people like me with sensitivities to lots of ingredients. There’s nothing in any of these products that is a waste of space or cheap filler – they’re simple and straight to the point! I’m really happy with my experience with these products. Overall my skin has actually been pretty great these past few weeks and I think that these products from CosRX are the reason! It might be TMI, but I was actually surprised by my period this week because I didn’t get my usual breakouts to warn me! 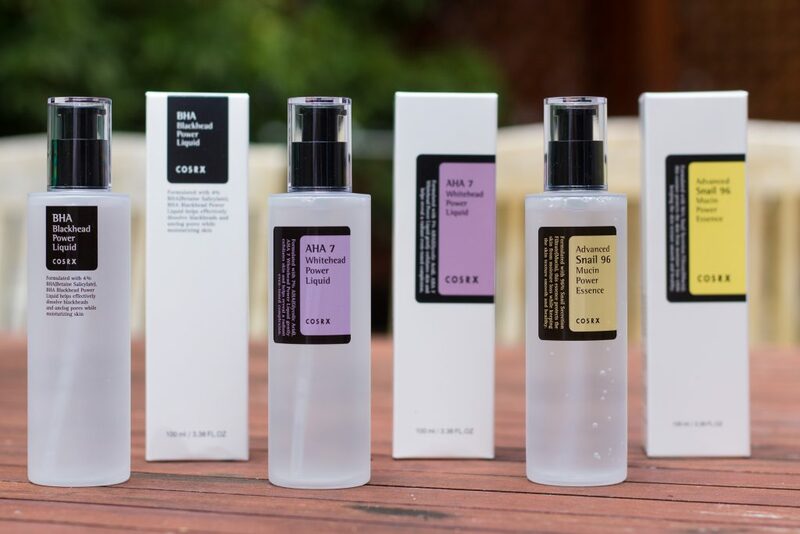 I can’t wait to try out some more things from CosRX, and I’d recommend checking out the brand if you’re interested in dabbling in some Korean skin care too. I’ve loved trying these new products (and also writing this post after my long break). Thanks for reading and I’ll see you all again very soon! PS: If you enjoyed this post and want help building your own routine, I think you’d love my FREE beginner’s skin care guide! It’s got step-by-step instructions and tons of product recommendations to get you going on your skin care journey! Check it out!